This is an easy way to avoid sleep time problems and fussy kids. Young kids require at least 10 hours of sleep. So make sure you switch off the TV at a fixed time every evening. 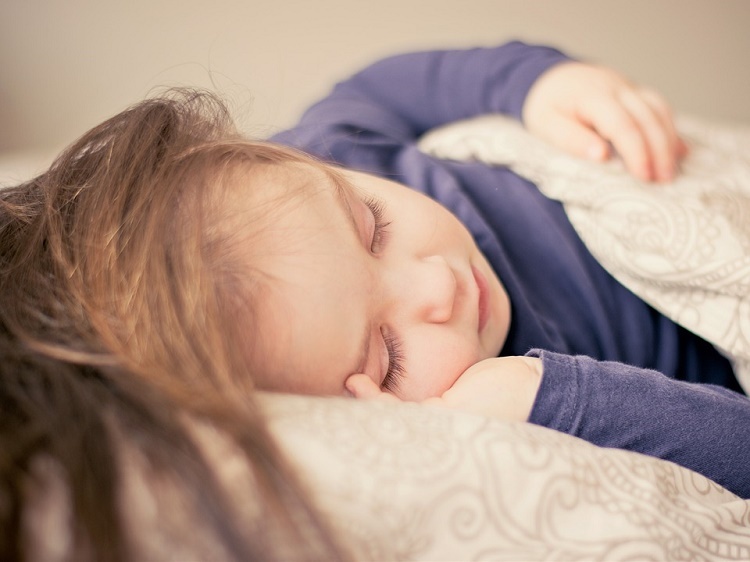 For babies and toddlers, total sleep time includes naps taken during the day; so instruct caregivers and day care attendants about the child’s nap times or signs s/he may display when sleepy. This will make it easier for you to get the child in bed at the right time in the evening. Physical activity along with mental games is necessary to tire the child out so s/he feels sleepy at the right time. Take the child outside for some games or a walk or, if the weather does not permit it, take the child to an indoor gym area to burn calories. Avoid energetic activities close to bed/naptime. Children love routine and parents should try to adhere to it. Avoid hosting late night house parties or other activities that could upset the child’s bedtime schedule. Make sure you follow the same routine even on weekends. Do and say the same things each night before bed. Reading to the child helps or you could sing a lullaby to calm them down. Establish a predictable, safe and comfortable place for the child to sleep. Do not make a habit of rocking the child to sleep in your arms or in a chair. Such a habit is difficult to get rid of and could cause them to wake up once you move them to their own crib/bed later. Parents have seen success by using certain pattern statements like: “Let’s find teddy, then let’s read together and cuddle together then take a nap”. You can even show some pictures to the child to help her/him understand why napping is important. Be calm and reassuring and try not to get angry if the child is fussy. If the child is reluctant to sleep because the day was so much fun, tell her/him what will happen if s/he does not sleep through the night or does not take an afternoon nap. Tell her/him that they can continue having fun upon waking up. Bedtime is not a time to roughhouse with the child or tickle or excite it. Avoid DVDs, games and tablet/computer based activities. Instead, use activities/items that can soothe the child such as lullaby, pacifiers, bedtime stories, soothing music etc. Co-sleeping can be habit forming. So learn to say goodnight to the child while s/he is still awake. Tell her/him that you will check back on them in a while. Avoid putting her to sleep in your arms, rocking chair or in your bed as s/he could get disoriented upon waking up in her room later. Pay special attention to the child’s diet. Avoid sodas, caffeinated beverages or sugary foods before bedtime. You can use breastfeeding or give a bottle or glass of warm milk as it can calm fussy kids and enable them to sleep quickly. Avoid letting the child fall sleep with the milk bottle in its mouth as it could lead to tooth decay. Make sure they brush their teeth after having a snack before sleeping. This can be established by offering choices. Let the child pick up the bedtime story or shut/open the door to the room. S/he can also pick up the time to go potty (before or after brushing teeth). Offer limited 2-3 concrete choices. You may leave a small night light on for the child. Do avoid bright lights or toys that make sounds which can disturb sleep. You can play soothing music or run a humidifier to block out other sounds like adult conversations or sounds from the TV etc. Make sure the temperature is comfortable for the child. Talk to the child and see her/his room from his/her point of view. Let them know you understand its fears. Provide a soft toy for her/his comfort. Use assuring sentences like, “I am right next door”, “we will have fun when you wake up” and so on. Encourage your child to sleep alone by showering it with love and praise each time s/he sleeps through the night in her/his own bed. “You are a big girl/boy”, “You are so brave” and other praise-sentences can help. If , despite these 12 easy ways, your child continues displaying behavioral problems during bedtime, then talk to a professional for other ideas and inputs.